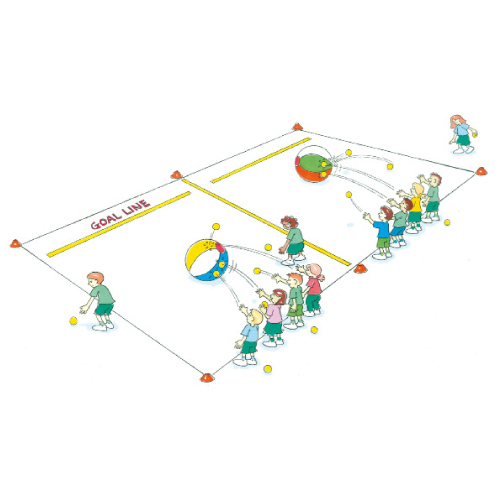 Bombard ball is a target activity that combines accurate throwing, tactics, teamwork and fun. Divide your players into groups of at least 4. The objective is for each group to get their team’s ball over the goal line at the opposite end by hitting it with smaller balls or bean bags. The team that gets the ball over the line first, wins. Use different ball sizes and time how long it takes. Where should we hit the ball to keep it on a straight line? Can you show me what type of throw will be most accurate? Why do you think this throw would be more effective? Where do you step when you are about to throw the ball? Where is the best place to stand so the ball doesn’t pass you? How do you work as a team to move your target ball forward?